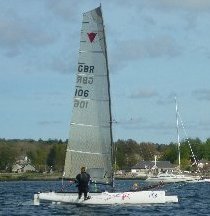 Im after a kite, J80, Melges 24, Cork 1720 etc. Its to go on a 12ft skiff for a "code zero" rig. Im putting on about a 9m mast and pole length to fit the kite! I know ill have to trim it down a bit to fit - but its only as a trial rig for the moment. Can you guys suggest anything? or know of any suitable kites for sale? -Many thanks goes out to all of my sponsors. So how big you thinking andy? I14 1482 For sale. PM if interested. Andy, are you sure your after a code zero? Light winds? Tight reaching? bar tight luff? No roach? Flat eliptical profile? surely your just looking for a big bstard assy kite rather than a zero ???? but the 12 has a bigger space to get it into than the front hatch on the J80! U the companionway, it's a lot easier!! I used code zero in non litteral terms - im after a big deep kite to go solely downwind, as we only race windward leeward. Its just gona be a little taller than my current no1, well 1m taller sitting on a 9m mast. J80 kite is only 5m or so bigger than my current kite - and that fits in the kite bin! with alot of: TOM hurrrry up!!! So after a big, deep, huge shoulderd kite to overpower us in 5 knots of wind! Gona be awesum! ps, prob gona be using a tornado main! Andy you can't cut a kite down properly. If you cut the foot off it and stitch on a new clew and tack it will set like a bag of $h!te and probably stretch and tear. Forget it mate, if you want a big kite I suggest you look for a big number 1 kite from down under and get Bob and Alan to stick it in the container. There is NO WAY an 18 kite will fit, they are ENORMOUS. See my picture on my 18 thread for 12 v 18 kite. You might at a push want to think about a 16 kite...dunno how big they are??? 1965 Flying 15 K797 "Braveheart"
Agreed, Chopping a Spi will not work ! Wanna learn to Ski - PM me..